In order to suit the precise requirements of our esteemed clients, our enterprise is dedicatedly engaged in providing PTFE Pigmented in the market. Because of its unique molecular structure, granular PTFE does not melt. It cannot be molded into complex forms like other plastics. However, it is easily machined on all standard equipment. PTFE machined components such as valves seat rings, roof packing's, seal cover, plug valve sleeve, wedge rings, ‘o’ rings, washers, bearings, balls, bushings, insulators , pipe joints, guides, beakers, piston rings, rider rings, hydraulic earth mover seal etc. and all types of components for non-lubricated compressor or any ptfe components as per customers sample. 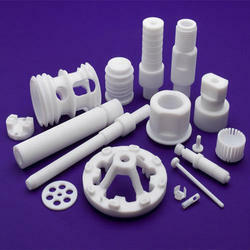 Hindustan Nylons manufactures Flumax brand PTFE and Filled PTFE Machined Components. PTFE Machined Components such as Valves Seat Rings, Roofing Packings, Seal Cover, Plug Valve Sleeve, Wedge Rings, O Rings, Washers, Bearings, Balls, Bushings, Insulators, Pipe Joints, Guides, Beakers, Pistons Rings, Rider Rings, Hydraulic Earth Mover Seal etc., and all types of components for non lubricated compressors or any PTFE components as per customer`s sample, specification and drawing. - Mechanical Packing: O/V/D/U Rings, Cup seals, Chevron packing.